catwalk: 1 a step-by-step approach to saving the tiger; 2 a platform extending into an auditorium along which models strut. I grew up in the north of England and did a fair amount of trekking in the Lake District; an area of outstanding natural beauty where the poet Wordsworth famously ‘wandered, lonely as a cloud‘. These days, however, you are unlikely to be lonely for long in the Lake District; the hills are strewn with long, snaking lines of fellow trekkers also out to enjoy the landscape. During the school holidays there are so many walkers on the hills that the path of the trail can often be seen from miles away, outlined by the garish colours of their waterproofs. I used to wish that all these other walkers would spontaneously self combust and leave me to enjoy the Lake District in cloud-like peace and, just for moment at least, give me the feeling that I had escaped from the rest of the world and entered a real wilderness. It was a feeling amplified each time I came across litter strewn on the ground, or when I was stuck behind a line of slow walkers on a narrow path… aggravating. But there is an upside to the irritation of having to share the outdoors with others – it means that there are more people who value these areas and thus more voices that will be raised in protest if governments or developers try to bulldoze over them. Coming to Malaysia I was gratified to find that the forests are generally free of other trekkers and my wish for solitude in the wilderness had finally come true. It is perhaps unfair to compare the Lake District to the staggering biodiversity of the rain forests of Malaysia, but to see a leopard cross your trail in the early evening, or hear a siamang ‘whooping’ at dawn, or watch troupes of dusky leaf monkeys sweep through the trees just hands-down-beat the sight of a cold and miserable looking sheep on a wet English mountainside. I genuinely found it astonishing that more Malaysians weren’t spending every possible free moment enjoying the forests they’d been blessed with. Over time I began to see the downside of this – many Malaysians don’t value the forests because they’ve never had the opportunity to really enjoy them or see for themselves the beauty that lies within. As a result these majestic forests were (and are) being cut down to make way for oil palm plantations and a seemingly endless tide of concrete without the public outcry that I would have expected. The rain forests, a national heritage that belongs to future generations as much as this one, seen more as a resource to be exploited in the short-term rather than a jewel to be guarded. Talking to Malaysian friends over the years began to shed some light on why so few venture into the forest – scared from a young age by stories of spirits and ghosts that, for some inexplicable reason, are believed to be found in greater numbers in the forest (surely there’d be more in the cities, right? after all that’s where most people die), tigers waiting to pounce, venomous snakes with deadly intent… the jungle nothing but a dangerous place waiting for the unwary to step inside. But, above all, what had put most of them off the jungle was that they’d had a bad first experience (often on some sort of school outward bound type course) that had convinced them from an early age that the jungle was a nasty, leech filled, wet and uncomfortable place that they had no wish to revisit… ever! The truth is that the jungle can be a hostile environment for the unprepared – but with the right attitude and gear it can be as comfortable as home. This, for me, is the key to junglecraft – not learning hard-core survival techniques, or roughing it rambo-style – but simply learning how to get comfortable in the jungle and enjoy your time there. For those Malaysians wishing to take a first, tentative step into the jungle there is no better place to start than on one of MyCat’s catwalks. These two days walks at the Sg Yu wildlife corridor near Taman Negara will give you the chance to see if you like the jungle or not – led by experienced guides and volunteers you don’t need to worry about getting lost or what to do in an emergency and, if you don’t feel up to camping just yet, you can always stay the night in one of the dormitories at the Ranger Station. Even better, these Catwalks are free, open to anyone in Malaysia (including visiting tourists) and, as they run over weekends, don’t require you to take time off work. The pace of these walks is very gentle and the distance covered no more than a few kilometers a day; so you don’t need to be a super-fit, gym freak to go on one. Most importantly, however, you will be doing a service to the wildlife in Malaysia….the Catwalks visit easily accessible areas at the outskirts of the park that are ‘soft’ target areas for poachers. A lot of poaching and snaring is opportunistic, done by poachers who want easy access to animal trails and often don’t have the time (or energy) to trek deeper into the forest. More often than not they have full time jobs and use poaching as an easy way of supplementing their income. Such people are easily put off if it becomes difficult for them to operate and having groups of Catwalkers in the area is a good way to deter this type of illegal activity. With members of the public acting as the eyes-and-ears in these easily accessible areas at the borders of the national park, the wildlife rangers are freed up to patrol deeper into the forest where the criminally organised gangs of hard-core poachers hunt for tigers and elephants. Time is quickly running out for wild tigers and yet we only need to ensure three things to reverse the trend: enough habitat, enough prey and effective protection from poachers. The hope is that if populations can reach healthy levels in Taman Negara National Park this will lead to tigers dispersing through the Sungai Yu Wildlife Corridor and into the Main Range. Is this happening? It is difficult to say as tiger numbers in Taman Negara are only estimates, however, one thing is for sure; in Taman Negara tigers have the ‘habitat‘ and they have enough ‘prey‘ so if, as some believe, their numbers are actually falling, then the reason can only be that the poachers are gaining the upper hand…and if the number of tigers drops below a critical level their populations will become unsustainable and they will become extinct. It would be a sad story indeed if the tiger, one of the national symbols of Malaysia, were allowed to become extinct because we stood by and did nothing while a selfish few hunted them down for their own gains. 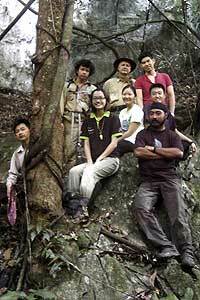 On a positive note, it seems to me that the younger generation here in Malaysia are genuinely concerned about protecting their environment and more-and-more are revisiting the forest and questioning the handed-down belief that a trip to the shopping mall is more fun that a swim beneath a waterfall in the middle of an emerald forest. Finally, an update! And an excellent one at that. Agreed about your opinion that most Malaysians don’t love the jungle because they never knew jungles personally. Malays have a saying – “Tak kenal maka tak cinta” which means you’ll not love something you don’t know. Wish I can go next time with MYCAT. Tigers are the symbol of malaysia. We Malaysian should appreciate them more. p.s. – Lovely article and as usual, full of conservation messages! First class, my friend. First class. Many thanks for the comment and I like the Malay saying you quoted – wise words indeed. I’d recommend the Mycat walks and hope you manage to get the time to go on one (although, for you, maybe the trailblazer would be a better option?). TrailBlazer? It’s been quite a while since any long range tabbing. But I do feel the urge watching your TrailBlazer vid. But an outstation of five days minimum is still quite ambitious as I’m still under some occasional commitment for this year. Perhaps next year we can blaze the trail together, eh? Yes – I’m definitely up for another trailblazer next year- will let you know….maybe get Keong to come along too! Paul: Just watched your Cat Walk video and it really struck a cord with me. I love two animals in this world above all others, Owls and Tigers. While I can’t keep poachers off game trails in the jungle, here in Atlanta we have a world class zoo that is part of the DNA gene pool reserve for the big cats. We make it a point to earmark out donations for the Tigers. It breaks my heart to see a picture of a carcass with the head and paws cut off. I once thought that some of these poachers had little other recourse to put food on the table but as you mentioned there in your video I find more and more there is no excuse other than greed. What a sin if we lose these magnificent animals just for the sake of a few dollars. Thanks for putting up that video I will be sharing it. As a knife collector I was excited to see the range of different blades carried by some of the folks in the video. There seems to be a very wide range of what works for folks. We almost lost our native bear populations here in North Georgia and North Carolina until very strict penalties were put in place. The bears were killed and their gall bladders were shipped to China for supposed medicine. You can now lose your auto, firearm, pay a 10,000 dollar fine and spend jail time and they are very serious about it too. I am happy to say that the poaching declined to the extent that legal hunting has now returned in some areas as the bears have rebounded nicely. Funds collected from legal hunting go to help manage the local wildlife. Here is a link to two births we happily had of Sumatran Tigers here at the zoo just last year. They are one of the worlds rarest and this gives a quick overview of the program at the Atlanta Zoo. My hybridized definition of Catwalk = strutting feline…meow! We have 9 at home with an occasional intruder. Nine cats! – makes me think of the of the cat-o-nine-tails that they used to use at sea! We have six cats now and they are already a handful so I a impressed that you can manage nine of them! In support of you summarizing to effect that most public members did not bother to take citizen actions because they still think that “poachers” are actually aboriginal people or very poor farming people trapping for food and consumption. So, they still think that it is okay to let these “poachers” harvest from the jungle. The truth is never further. As a boy who lived in the fringe of Primary Jungle Reserves up north Peninsula, I did my share of trapping for consumption. My dad, my villagers were all part time trappers. PERHILITAN (used to be called Jabatan Mergastua) was always patrolling there and they never bothered us. They knew we were not poachers as we trapped only small mammals for consumption and we did not catch excessively for fun or business. Believe it or not, my dad and his friends were also the ones who taught me conservation in the first place. I’d often heard them discussing at night, saying things like ‘This area’s very short of mousedeer. We better not trap mousedeers for a year or so. If not, we’ll never get mousedeer meat again.’ or ‘The Senoi (an Aboriginal tribe) told me that we should trap further up north. Let the animals feed on the jungle fruits near south till they are plenty again.’ In short – even Mergastua did not consider us poachers! He is just one of the biggest trader, there are still hundreds if not thousands of their breed infesting this country alone. But just to say how BIG Anson Wong is – he was even investigated and reported in by National Geographic Society Magazine. Too bad, unlike where in the US where our friend Bruce R resides, in Malaysia there is virtually no hope for conviction and prosecution. The poachers are usually illiterate orang asals or poor locals with questionable citizenship and made them hunt the animals for a very small fee and the trader profited enormously. These poor poachers, having never even seen a RM100 note before, rejoice on their new found work and the ability to finally buy school uniforms for their kids. As a MOST minimum effort, citizen like us can reject the use of wildlife meat or body parts anywhere they are being sold. Those who are more compassionate can even join MYCAT and MNS for further actions. ONLY with citizen actions we can stop this. Many thanks for an extremely interesting comment and you raise some very good points. I like the stories of you parents generation and how they adjusted their hunting to ensure that they don’t over hunt – it reminds me of the native American practice when collecting herbs from the forest: they wold never harvest the first plant they came across of a particular species and only take the second one they found, that way they always knew that at least one plant would be left in the forest to propagate the species. I also think you are right that the poachers are in it for the money (rather than for food) and that it isn’t that hard to tempt people (especially those who are poor/without work permits etc) to hunt for these animals. In some ways the middle men are more at fault than the often uneducated people who go in poaching on their behalf. But of course, if there was no demand for these products from the end consumer (i.e. Chinese Medicine shops) the poaching would stop of its own accord. A lot of the use of these exotic animal parts in Chinese Medicine is clearly nonsense – Rhino horn is simply keratin (the same stuff found in fingernails) and if people really believe it has some sort of magical healing power, then they should simply bite their nails all day! I have heard, however, that some of the less reputable Chinese Medicine shops that sell these sort of exotic animal remedies will add steroids to the mix which will give people a short-term feeling of recovery (but does nothing to cure the actual disease). I was in Borneo earlier this year and i was sad to see tiger claws, teeth and parts of their pelts being sold openly! When the buying stops, the killing will end too. No doubt it is illegal in Malaysia to trade in animal byproducts of endangered species, but it doesn’t seems to be seriously enforced. Completely agree with you that without the demand the poaching will stop. 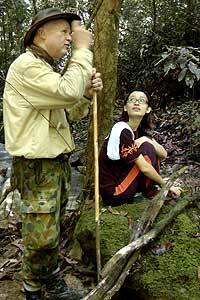 Where were you in Borneo? Malaysian or Indonesian side? If it was in Malaysia and you can remember where and when you saw the pelts begin sold then let me know and I’ll report it to Mycat and they will take it up with the wildlife department.